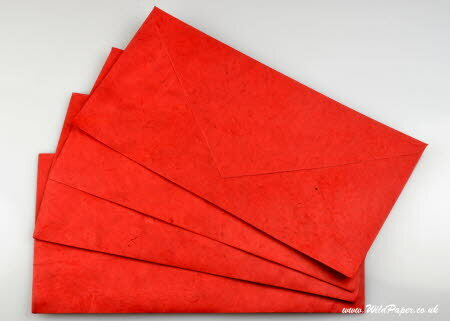 These envelopes match our Red paper, from the Vibrant A4 Computer Paper range, and our Red gift tags and Red lokta string. Envelopes enclosed in a cellophane bag and sent in a boardback envelope. The DL-size envelope is 110x220mm (approximately 4 1/3 x 8 2/3 inches) and holds an A4 sheet folded twice into 3 parts. This is the most common size of envelope and most offices send out their branded stationery in this envelope size. None of our handmade envelopes is gummed, so you can use a closure method of your choice. A very effective closure method is double-sided tape or adhesive gum sticks such as Prit-Stick.